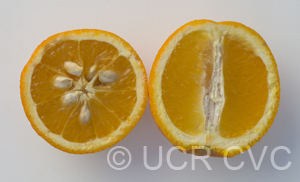 Source: Received as seed from Dr. John Carpenter, USDCS, Indio CA, 1960. Parentage/origins: Parents unknown. Originally from the Station Experimentale de Sidi Slimane, Morocco. 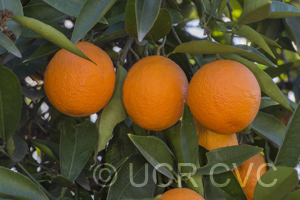 J. Carpenter: A sweet orange with ornamental characteristics. 2/8/1988, EMN: Not "nearly seedless" but seeds are few. Otherwise fruit of this accession fits C.I. description very well.
" 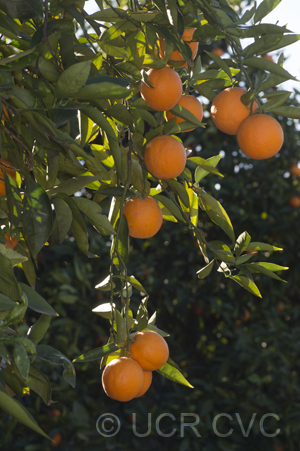 This Moroccan variety is a beledi selection or unknown origin that was formerly of local importance and has now been replaced largely with better varieties. 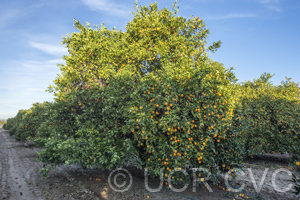 The fruit matures in midseason and is nearly seedless, medium-small, and oblong to oval, with a medium-thick, tightly adherent rind. The flesh is tender, melting, and of good flavor. The tree is moderately vigorous, somewhat upright, and possesses an alternate bearing tendency. "